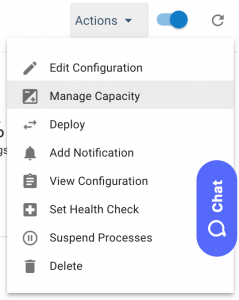 The Manage Capacity option in the Elastigroup’s Actions menu simplifies the process of updating the Elastigroup Target, Minimum and Maximum configurations. If the group has an unexpected capacity configuration, check for scheduled tasks that may have triggered capacity updates. Note that capacity updates affect the limits that the Elastigroup is able to scale to. To update the Elastigroup capacity, select the desired Elastigroup in the Elastigroups view. Under the Actions menu select Manage Capacity. Modify the Target, Minimum and Maximum as needed and click UPDATE. Warning: The capacity update will take effect immediately. Once the update is initiated, the Elastigroup will begin to scale up or down accordingly.